It's safe to say we are due for a much needed vacation. Get out and enjoy it but don’t let your hair suffer. Here are some tips to get you through transitioning to natural hair during the summer months with maximum length retention. Sleepwear: Take your scarf, bonnet or satin pillowcase with you to protect your hair. Accessories: Pack plenty of hairpins, snag-less ponytail holders, cute head wraps. You can switch your hair from poolside to evening turn up ready in minutes. Products: Travel sizes are the way to go! Stick to 2-3 oz. travel size products to take with you. If you absolutely need a large-sized product, be sure to wrap it well and place it in a Ziploc before putting it into your checked in luggage. My favorite travel set is the In Bloom set. If you are a DIYer or not that great at braiding hair, this style is definitely the way to go. Ambrosia walks you through how easy it is to install these chunky twists at home. Watch and see. This style is super chic and requires almost no maintenance. Mist with a liquid moisturizer as need and tie your braids down nightly with a satin or silk scarf. Watch how Samantha achieved this beautiful style in her video. 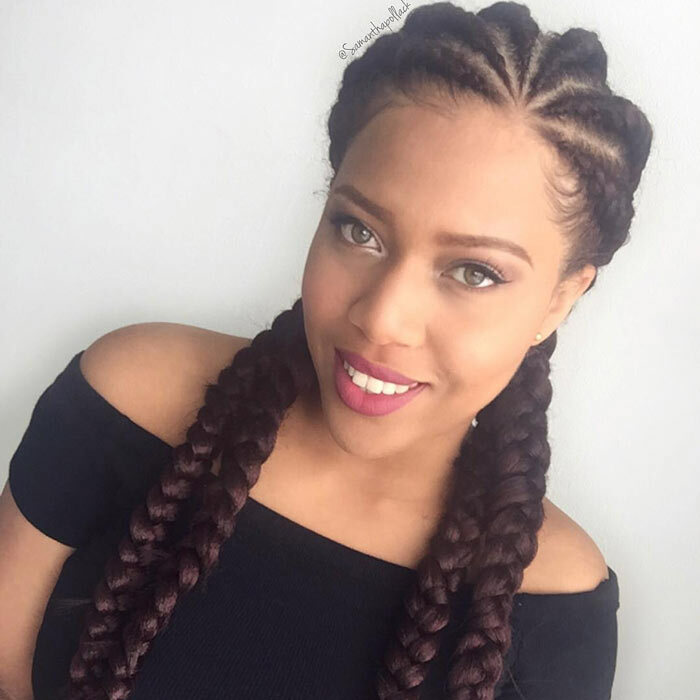 Check out Kymberli’s box braid bob. It is super cute, easy to do, and very versatile. She shows some fun ways to style your bob too. Wet your hair thoroughly with water prior to swimming. If your hair is loose, coat it in oil. Be sure to use inexpensive oils such as olive oil. It will act as a barrier to prevent the hair from swelling. If you are rocking braids or twists, just wet your hair thoroughly. No need for adding oil to it. After swimming, cleanse your hair with a swimmers shampoo. It will remove minerals and chlorine from your hair. Follow up with a moisturizing conditioner. If your hair is in braids or twists, add the shampoo to a dye applicator bottle with water. You can apply the solution directly to your scalp and the length of the hair. This will aid you in full saturating your hair. Then rinse it out very well. Be sure to moisturize your hair with a lightweight leave-in conditioner. Liquid moisturizers are my go to items. Just mist your hair very well, apply a little oil, and you’re done. Super easy!